Jabra Move Wireless review | What Hi-Fi? Headphone manufacturers must be delighted at the current interest in all things wireless. Simply add the technology to existing models, and stick another £100 (or more) on the price. But Jabra doesn’t play that game. The Jabra Move Wireless headphones are affordable and have all the important elements of good Bluetooth headphones, including enjoyable sound. The Jabra Move Wireless are petite on-ear headphones, like the AKG Y500 Wireless and Beats Solo 3 Wireless but with a slightly skimpier frame. From a distance you could easily assume they are more expensive than they actually are. A fabric-topped headband and chunky metal stems don’t instantly mark them out as some of the cheapest on-ear wireless headphones around. However, on closer inspection, there are a few signs of the low price. The plastic on the cups feels a little cheap. It’s not flimsy, and the Move Wireless headphones don’t feel like they’re a drop away from falling to bits, but more expensive headphones tend to have thicker plastic. They don’t fold up either, but we wouldn't advise mistreating the headband. Flex it with some force and you can hear what sounds like the glue between two layers complaining as those layers are almost prised apart, which is slightly worrying. Our review sample is a red/black version, but there are also all-black and blue versions, plus a black model with gold highlights. 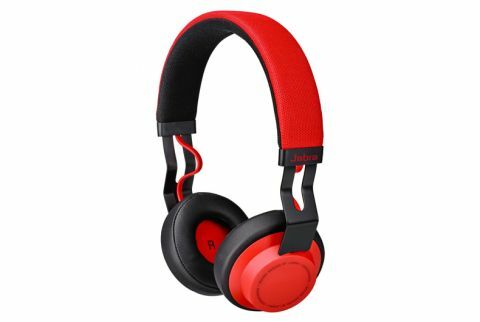 These Jabras are reasonably comfortable, but subject to the same issues of most on-ear portable pairs. Their headband does exert some pressure to keep them on your head, so they may cause some ear discomfort if you move about a lot or wear glasses. They are no worse than the average set of this style, though, the soft synthetic leather-topped padding providing a decent buffer. A few hours at a time won’t leave you with earache. What is perhaps most impressive about the Move Wireless headphones is their wireless performance. These are among the cheapest Bluetooth headphones we’ve seen that don’t test your patience with frequent signal drop-outs, which in some budget pairs can be caused simply by moving your head too quickly. There’s none of that here. The Jabras have wireless stability comparable with sets two or three times the price. The signal is even stable towards the outer reaches of Bluetooth’s range, with transmission over 8-10m causing no issues. Jabra made Bluetooth wireless headsets before a lot of today’s headphone-makers even existed, and that experience shows. Battery life of eight hours doesn’t match more expensive pairs though, with around 15-20 hours the standard (the Beats Solo 3 Wireless are in an entirely different league with a 40-hour life, while the AKG Y500 Wireless claim 33 hours). It’s still practical longevity, however, particularly when completely wire-free ('truly wireless') headphones like the Apple AirPods tend to last just 4-5 hours. There is also a 3.5mm socket and a supplied cable for wired listening when the battery runs out. The Jabra Move Wireless headphones sound good enough to justify their price tag, even if they weren’t wireless. Describe them in the most basic terms and their signature sounds almost perfect for a portable headphone. The mid-range isn’t seriously recessed either. There’s a surprisingly solid sense of balance, tweaked just a little for a more crowd-pleasing tone. What the Jabra Move Wireless earphones don’t have are the elements that turn a decent headphone into a great one. Their soundstage is only moderate in size, dynamics aren’t mind-blowing and while the perception of detail is fairly good, it’s partly provided by some granularity to the mids and treble rather than actual high-grade insight. Of course, at this price we don’t expect any more than the decent sound framework the Jabra Move Wireless headphones provide. They cost less than you'd expect to pay for premium headphones that ‘go wireless’. That they still have a solid design, reliable wireless and decent sound is quite remarkable. Fairly good tonal balance and decent clarity give them the building blocks of good sound. Dynamics, separation and the scale of the soundstage are less impressive, but to expect those at this price is to demand a minor miracle. However, if you’re on a tight budget, these are a good buy.